The University of Texas archaeological Programme in Belize needs willing students to help excavate sites in this rich & remote region. Virtual reality, one of ardes’s specialities, is a great solution to help them achieve this goal. Students must first of all be assured that they can handle the rigourous life of the jungle. The 7-node panorama of the Field Camp provides potential workers with a rich knowledge of the Programme’s well-thought-out accommodations. While ardes visited the Programme in Belize, we accompanied some archaeologists on a dig at Dos Barbaras. 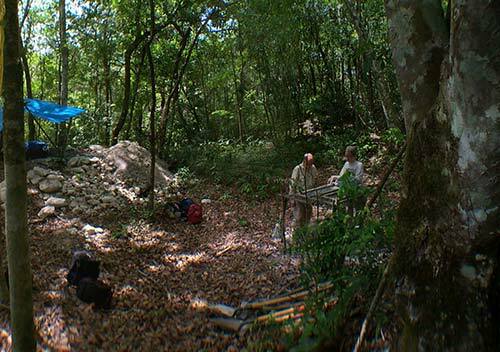 The second, dual-node, panorama shows just how dense the jungle is in this region; the second node shows the work these people are doing in an excavation pit. It’s an unforgiving locale & these people work under extreme conditions. ardes were contracted to return in the following dig season to help Dr. Brandon Lewis document the Dos Barbaras dig. Because the Programme for Belize is located in the middle of a protected rain forest, the archaeolgists can’t leave the excavations open; they must be covered at the end of each season & covered fully when the excavation is completed. Moreover, after the excavators clear the ground of saplings & small plants, the jungle will reclaim them in a matter of weeks. It’s difficult to even get an accurate lay of the landscape. Virtual reality provides a compelling, immersive snapshot of the cleared land. The nine panoramas that ardes created for Dr. Lewis forms part of the documentation that he relies upon for his forthcoming book. While Dr. Lewis is finishing his book, we’ve placed the panoramas online in our “Belize Diary”, along with write-ups of our experiences of living & working in Belize. 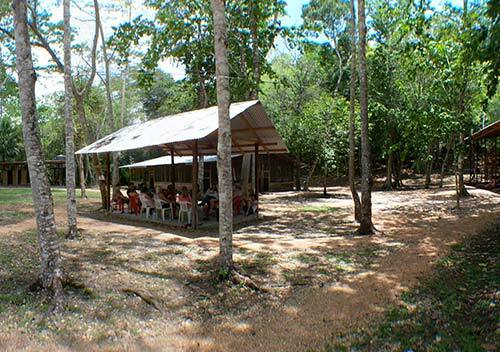 After our panoramas of the Programme for Belize’s Field Camp were placed online, the Programme received larger numbers of applicants. This is crucial, because the Programme relies on students not only for labour, but also for funding: more people means a healthier Programme all in all, as more people join the work & more pay to do it. The nine panoramas that ardes created for Dr. Lewis will form part of the documentation on CD-ROM that will accompany his forthcoming book on Dos Barbaras. They will form part of an invaluable insight into the region. Certainly, they will be unique: few archaeologists have availed themselves of this technology. See more of our virtual reality work.